Another Child Foundation offers a unique opportunity to sponsor an at-risk, severely impoverished Roma child. Because ACF is a small ministry, you receive regular updates and pictures of your child throughout their school year and on special holidays. Many sponsors have even had the unforgettable chance to meet the child they sponsor! 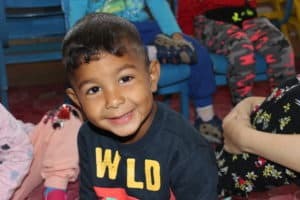 Not only are you able to connect with and pray for a precious child who lives across the globe, you also provide them life changing support! Your vital support ensures each child gets a Christian based education, nourishing meals, clean drinking water, hygiene, medical care, new clothes and shoes, life skills classrooms, and most importantly they receive the Gospel message and are taught about the love of Jesus. Many of our sponsors have expressed how blessed they are knowing the huge difference they are making in their sponsored child’s life! We’re so thrilled that this year the Point of Hope has added 14 new preschoolers to its program! Some of these adorable children are still in need of sponsors so we can continue to love, provide for, and minister to them. Each week for the next couple of months, we will be highlighting one of these new little lives whom we have the honor to serve. This week, we’d like to introduce you to Ianis Ismail. You can check out Ianis’s entire profile and become his sponsor by CLICKING HERE!